ReacTable Mobile has arrived for iOS mobile devices – even handhelds – bringing the visual, modular sound-making environment to the masses. Apart from building your own interactive musical table, the only way to get ReacTable’s software previously was to spend some EUR9700 – and get on a waiting list. Now, any Apple mobile device will do the trick. I’ve been talking with the ReacTable crew, so hope to cover this in more detail soon. In the meantime, I’m back to playing a mobile game called “shake your jetlag,” and thanks to everyone who sent this in! Addendum: At least one person on Twitter (Elliott Fienberg) points out the one disadvantage of this is that the original ReacTable is a tangible interface – physical objects you can move with your hands. And that’s worth saying; there’s something rather significant missing in the iOS translation. The iPad et al are undifferentiated glass surfaces, intuitive to use but lacking in physical feedback. I can certainly see a place for both approaches. It’s also possible look at the same question from a different angle. Multitouch, once an exotic technology, is now a commodity, shippings on millions (perhaps, soon, billions) of devices. 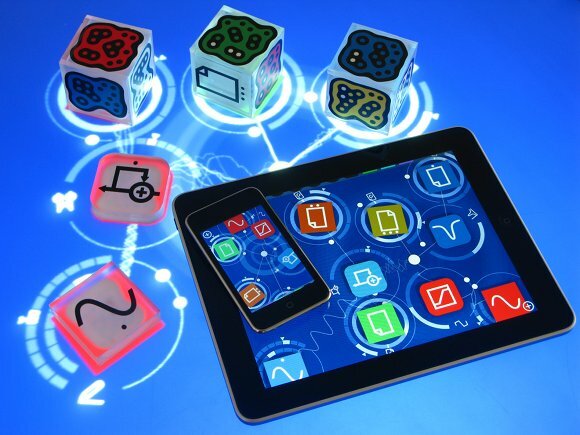 I wonder what form the tangible future imagined by ReacTable might someday take, and indeed, if it might re-emerge in more economical form. In the meantime, as you’ll read in comments, ReacTable works surprisingly well as a multi-touch interface, even if it was originally conceived for objects. You’ll likely be happier with the iPad’s larger surface area, and you’ll want a current-generation device for its greater processing power, based on feedback in comments. I hope to offer more a complete review after some tests on devices.